Thorniest of the wild roses, this low-growing wildflower adds a special layer of delight to seaside walks in spring and summer. A spiny upright perennial with hairless leaves each divided into seven to nine toothed leaflets, the Burnet Rose rarely grows taller than 50cm. Its five-petalled flowers 3-5cm across are white, often splashed with pink. 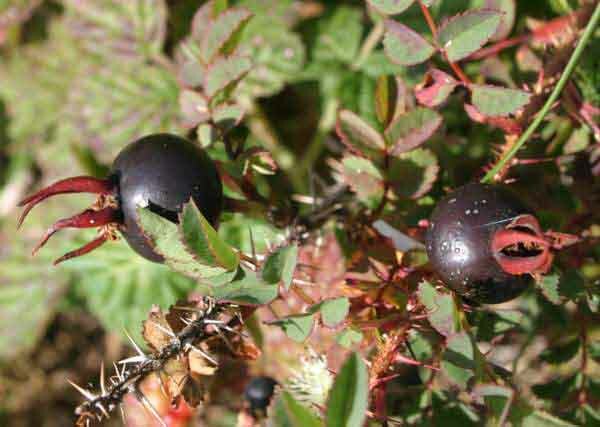 The hips (seed pods) are purple; all other wild roses have red or scarlet hips. This lovely summer wildflower is very common throughout Britain and Ireland, largely but not solely in coastal areas. Its range extends over most of Europe, parts of Asia and North Africa. Rosa pimpinellifolia makeswonderful displays in the grykes of limestone pavement; it scrambles over stable sand dunes, and is found also on chalk downland and grassy coastal cliffs. 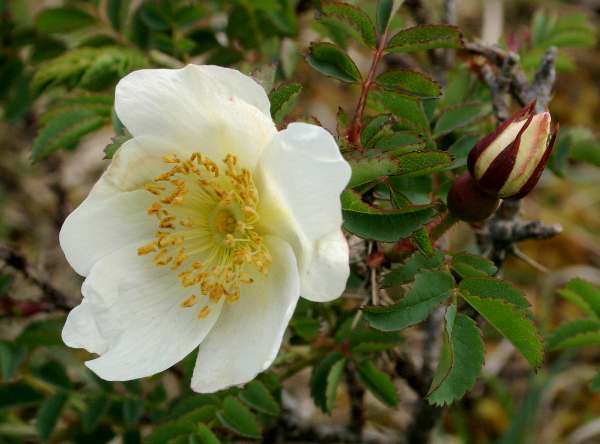 Burnet Rose can be seen in flower in Britain and Ireland from May until the end of August, but they are usually at their best during June and July. 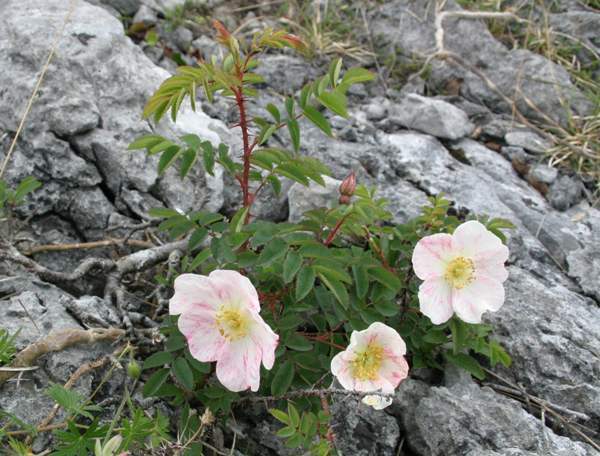 There are several wild rose species, including the white Field Rose and the Dog Rose. Burnet Rose plant used to be grown in gardens for use in herbal medicines. The leaves and the hips were used to make Burnet Rose Tea, while rose-hip syrup and even a liqueur can be made from the large purple hips. There is just one thorny problem that makes gathering rose hips a risky business: the thorns! Burnet Rose has lots of sharp spines. The seeds of roses develop in shiny cases called rose hips. Pictured on the left are hips of the Burnet Rose, which turn deep purple in the autumn when they are fully ripened. Rosa, the generic name, may be a reference to the reddish colour of the flowers of most wild roses. The specific epithet pimpinellifolia refers to the pinnate form of the leaves. 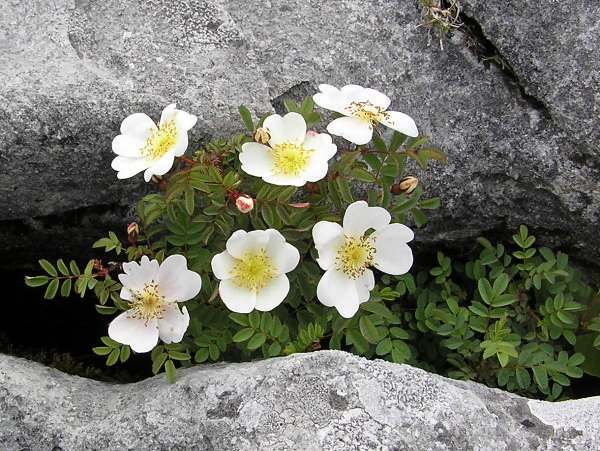 The photographs of Burnet Rose shown on this page above were taken in The Burren, an extensive area of limestone pavement in County Clare, south-west Ireland.